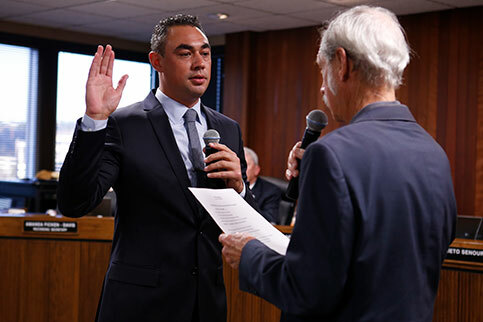 Yesterday, I raised my hand, swore an oath, and officially began my term as a San Diego Community College Board Trustee. The moment was emotional and a bit surreal. A journey that started in 2016 with the inspiring stories of community college students and professors culminated into the ultimate opportunity to represent our community and fight for a future they believe in. After taking my oath, I had a single thought: the real work begins now. And while I may be the one sitting on the board, I will not being doing the work alone. See, just as the campaign was a team effort, so will be my tenure as a Trustee. I will look to you and the rest of the community I now represent for inspiration, motivation, and ideas to accomplish the goals our campaign set. I was imperfect as a candidate and will be imperfect as a Trustee, but I promise to give everything I’ve got to fight for opportunity for all. This won’t be the end of my communication with you. From day one, it was our goal to draw back the curtains so you could see what running for office looked and felt like. Now, we get to do the same with holding office. I will be using my website and social media pages (Facebook, Twitter and Instagram) to share stories from my experience as Trustee, as well as provide opportunities for you to help create the future we campaigned for. With that, you can help the San Diego Community College District get closer to our dream of making college free for everyone by making a tax-deductible contribution to the San Diego Promise Program.